There is nothing new presented. CD 16 bit and 44.1 KHz redbook has long been known to be a technically perfect format for distribution (if produced correctly). The only problem with CD redbook is the inadequate design of DACs for playback. Too many, if not most DACs, suffer from differential non-linearity, IMD, jitter and other issues. The ONLY reason that higher resolution works better for consumer playback is the inadequacy of the majority of DACs and the possibility of better DSP accuracy with greater bit depths and sample rates. A higher sample rate and a greater bit depth on playback has the tendency to help randomize timing and amplitude errors and facilitate filtering such that it is all further from the audio band and less audible. Finally, studios actually do need greater bit depth and higher sample rates because the recording, mixing and mastering process involves digital manipulation and greater resolution offers much better mathematical accuracy when massaging the audio. It is the MQA filter which created the typical sound signature, some like this kind of sound which may resemble to old analog sound with some distortion… but I don’t. Music is supposedly being created for what they sound originally but not to process again to sound like something else. Digital filters in PCM have a large impact on SQ and this is an evidence. One can imagine there so many MQA filters (more than 16 of them) and each is used for different music contents. This tunning process of applying different filters on different music contents is like applying a subtle EQ to their likings. I was not aware of 16 filters. I guess if they tailor the sound towards what listeners like then that is good but the claims of Master Authenticated are just silly if the reality is some kind of pleasant DSP. I believe that tubes are a very effective way to reduce the effect of masking (a loud sound of lower frequency masks higher frequencies that are close above it). I roll tubes to find ones that are most effective to get stuff out that tends to be buried by electric guitars. Rock has nearly always been a fight between guitarist drummer and vocalist with everyone trying to be loudest! Only in his old age did Page finally give us more detail of Bonham’s handywork…the deluxe LZ editions from around 2014 are nice because the drums are more audible. Some background on the different filters here. These are different filters applied during rendering / upsampling (after core decoding) to supposedly compensate for differences in DAC characteristics (and recording chain, I suppose). Which filter would be the correct one to actually compensate for any deficiencies in the end to end chain is a bit of a shot in the dark. On top of that, a DAC that needs compensation of deficiencies in this way would be a pretty lousy one. Differences in DAC performance tend to be below -100db, well below the threshold of audibility (see stereophile or audiosciencereview for examples of measurements). But “end to end control” sounds good in marketing. One can imagine there so many MQA filters (more than 16 of them) and each is used for different music contents. This tunning process of applying different filters on different music contents is like applying a subtle EQ to their likings. bottom line is play it without mqa if its available and with and see what works best with your setup. add the one you like best to your library and the other not. No, I cannot imagine that. In a modern digital recording of a band with analog instruments there are hundreds of A/D conversion with different converters. How will you ‘componsate’ all this conversions. These kind of claims are not believable and one of the reasons people like me have a strong snake oil feeling about mqa. These filters are ALL minimum phase and apodizing. They are leaky from an aliasing perspective. They broaden the transient/reduce the peak amplitude. This can ONLY be described as distortion. Look at this filter - it is an appalling design. This isn’t science. It is total BS. Scientifically an ideal filter is the white line. 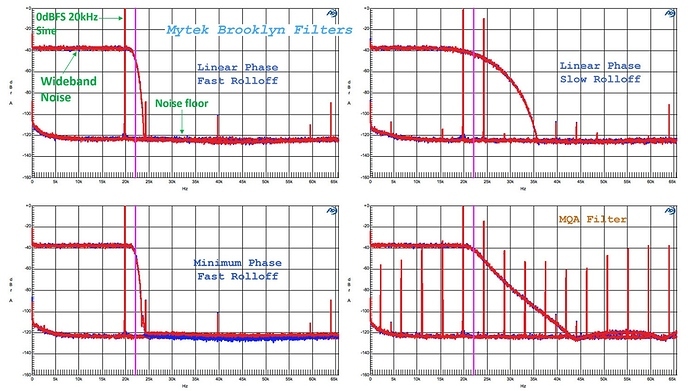 In practice a filter should have a transition band between 20KHz and 25KHz. I am not surprised this is audible because it is awful. If people like the sound then they enjoy added distortion - it is as simple as that. Hundreds of A/D conversions? That sounds very unlikely. Presumably you have recording experience or some evidence to back that up? I think these claims are credible, the logic is clear, the rationale sound. The way I understood MQA is that it is stored at 44.1 KHz (compatible to a CD player) and then unfolded roughly twice to 192 KHz. So the approach relies on upsampling. Upsampling creates reflected ghost images in the adjacent audio band. So 44.1 KHz upsampled to 96KHz will have a ghost image from 22.1 KHZ to 48 KHz. If upsampled directly to 192 then there will ghost images from 22.1 up to 96KHz. Because of this scientific and mathematical certainty of ghosts the upsampling process requires a sharp filter at 22.1 KHz. This sharp filter ensures that a ton of distortion isn’t created above 22.1 KHz and below the new Nyquist of the higher sample rate. From what should be obvious to anyone, MQA process is fraught with distortion from their poorly designed filters. 44.1 & 48 stay in the same source rate family when unfolded and then upsampled by MQA software and/or hardware. Same would apply with the original downsampling MQA does before folding. So you can explain about the hundreds of AD conversations then? Or is it just anti MQA mantra? Exactly, all MQA files always exist in 44.1/48kHz in a unfold state. If you compare between minimum phase vs MQA filter, you can see, MQA has a much slower roll-off, this type of filter is extremely leaky; it only get fully attenuated at 44.1/48kHz (MQA core output sample at 88.2/96kHz)! Just imagine if you do sampling at 44.1/48kHz to a MQA filter, it is as good without using any filter! Speak with a sound engineer or go to studio and watch a recording session. And please stop bashing me for not accepting the claims about mqa. Dude, MQA encoding is done only at the final stereo mix down, i.e. The copy is used for final distribution as lossless Hi-Res downloads and streaming (Qobuz Hi-Res). This copy is then sent to MQA Ltd for in-house encoding. Just to be clear, MQA processing is NOT done during the A/D conversion nor during the recording session. The recording studios do not have any access to MQA hardware whatsoever. By the way any MQA processing done before mixing console will simply destroy the code integrity and cannot be decoded in the end. So your assumption of compensating A/D deficiencies in the beginning is really questionable. From multi-track recorders with multi A/D converters to mixing consoles doing DSP such as EQing, editing and bump up some gain to create some loudness then do a final mix down to stereo copies. This is then sent to MQA Ltd for encoding. Do you think after so many processes involved, they can still compensate every A/D converters used before hand? Do not get fooled by those dubious claims, do some research and ask yourself if this is really a possibility. This was on Facebook, I couldn’t share it but took a screen shot. 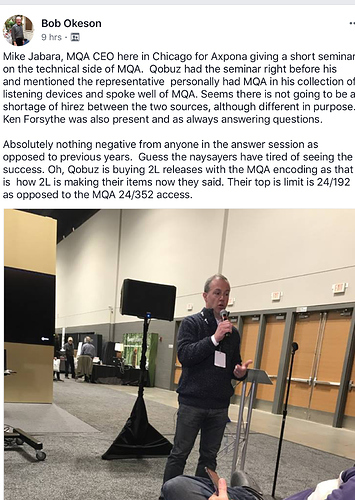 MQA isn’t involved at all in the recording stage. It is not involved in any of the recording process(es) that may be used in producing a digital master. MQA is involved in the process of producing distribution digital files from a digital master, used to distribute for public consumption. It can also be used to ‘treat’/process a digital master, prior to distribution of the MQA’d files for public consumption. To reiterate: MQA has nothing at all to do with the recording process itself, which is generally to PCM/DXD. MQA only becomes ‘involved’ post-master production. 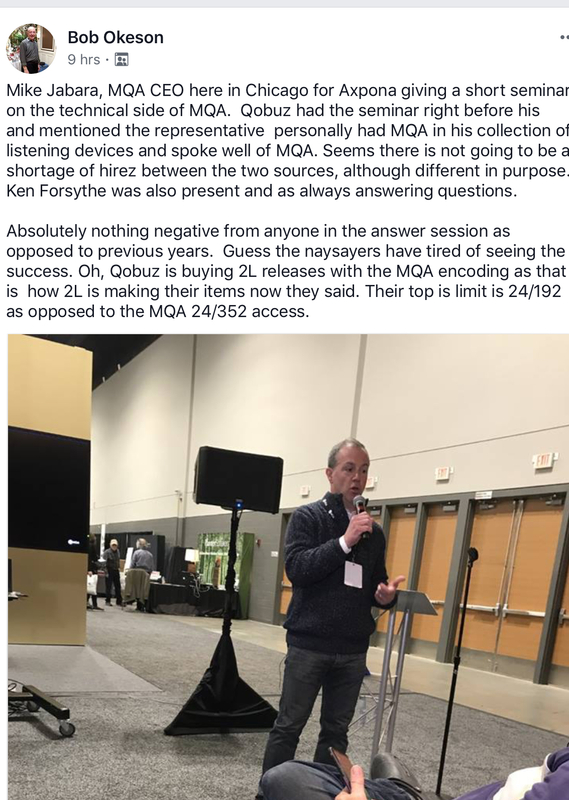 2L recordings are indeed distributed via Qobuz as MQA. It would seem that’s the only format they’re using to distribute their music via streaming services.